I don’t know why it is, but all kids love frozen food. You can sneak or fully disclose all kinds of fruits in vegetables in a smoothie or popsicle. The BellyFull Kit makes it easy! The HopeFULL company began in order to help out a dear friend who had been diagnosed with Leukemia. A week later we delivered our frozen “whole-food pops” (now known as HopeFULLs) to our friend, each with a unique message of hope. The HopeFULLs satisfied her pallet, soothed her mouth sores and filled her tummy with healthy fat, protein, calories and nutrients when she needed it most. We also brought with us a message of hope and peace. 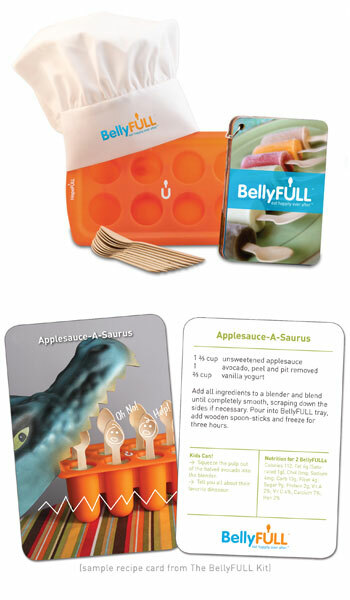 This inspiration has continued and expanded to include a line for children called BellyFull. I can see my kids really getting into these pops! I especially like how the little recipe book is kid-friendly. If they make it, they are more likely to eat, and it is one less thing for me to do! Obviously, any child would benefit from these recipes, not just picky eaters or those that are medically sensitive. Many of the recipes include infant rice cereal, and really, I don’t know why we don’t continue to use it in recipes after our toddlers make the switch to whole foods. Rice really is easy to digest, which is the whole point of these recipes. I also like how the wooden spoons are used as handles for the frozen pops, and of course, you can use the silicone molds with any recipe. Also included in the recipes are sections on “MindFULL Eating” and “Merry Berry Meditation”. In our rushed lives, we often shovel our food in without being mindful. It is something that we all need to practice and is important to instill in our children at an early age.